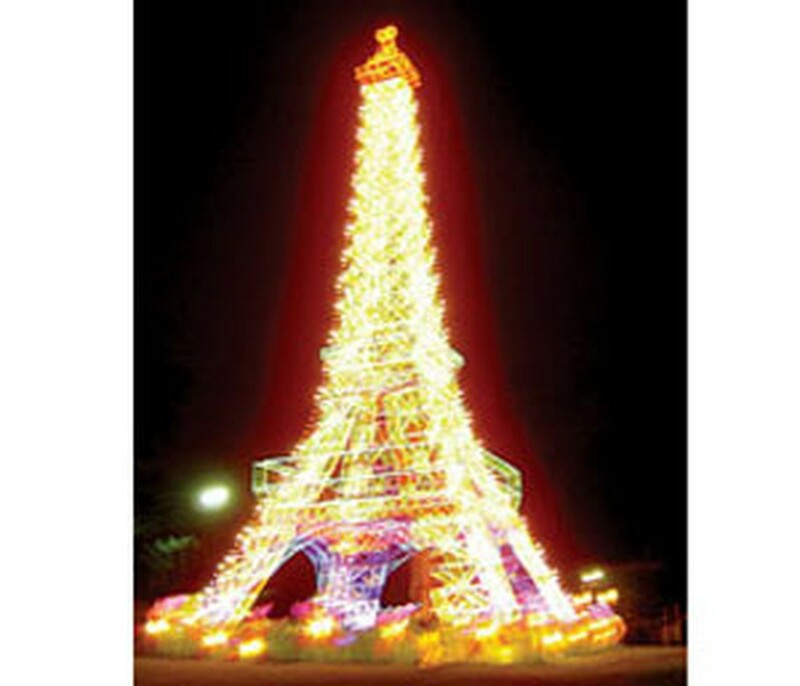 The Eiffel tower is created in a miniature at the Ho Chi Minh city’s Zoo and Botanical Garden (Thao Cam Vien). Many world and Vietnamese wonders were created in miniature in Ho Chi Minh City by Chinese and Singaporean artisans for a show to mark the upcoming New Year, Valentine’s Day and the Lunar New Year festival. Around 40 leading artisans worked hard for almost a month to create The Wonders of the World at the city’s Zoo and Botanical Garden (Thao Cam Vien). Apart from the world’s famous wonders such as the Eiffel tower, the Great Wall of China, the Pisa leaning tower, the Taj Mahal,… Viet Nam’s best-known landmarks such as the One-pillar (Mot Cot) Pagoda, and Ha Long Bay were also built on scales of 1:30 to 1:10, using some 30 tons of steel and thousands of lanterns brought in from Singapore. These will be part of a show from Dec. 31 to Feb. 25 which will also feature lots of entertainment programs and displays of lantern models of 150 animals and plants. Three months ago the same festival was held in Singapore’s Chinese Garden and had attracted over 300,000 visitors. Besides, it has been successfully held in over 15 countries and territories like the US, Korea, Italy, Canada, Taiwan, the Philippines, Thailand, and Malaysia over the past 20 years.